Hoops for Hope has raised over $260,000 since 2010. 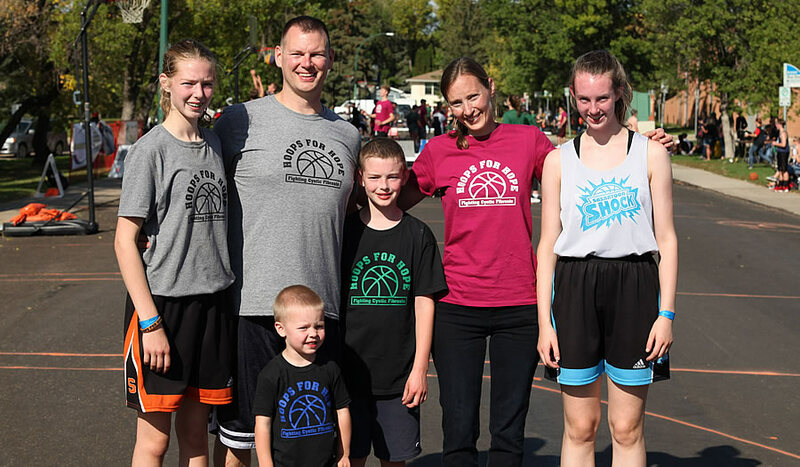 The annual 3 on 3 basketball tournament was created and is coordinated entirely by volunteers; Shaun and Katarina Nechvatal and Sharlene McNairn. Shaun and Katarina have four children, two with cystic fibrosis. Shaun and Katarina Nechvatal and their children Eva, Anika, Dominic and Benjamin. The Nechvatals do a total of four or more hours of life-sustaining therapies each day for Dominic and Benjamin. All proceeds from Hoops for Hope support the work of Cystic Fibrosis Canada. To learn more about cystic fibrosis and the fight against it click here. Nearly 200 athletes on more than 50 teams playing on 8 courts. More than 50 volunteers, including the Men’s and Women’s Huskie Basketball teams, POW City Kinsmen, and the Saskatoon and District Kinettes, working together to make Hoops for Hope an exceptional experience. Online registration and fundraising making support for Hoops for Hope easy. More than half of donations are done online. Facebook and Twitter posts allowing Hoops fans to be kept up to date on all things Hoop for Hope – including information about sponsors and the fight against CF. Free tournament T-shirts for players and volunteers. Amazing draws for top fundraisers including the Grand Prize draw of 2 tickets anywhere Air Canada flies in North America! Barbecue open to the public. An awesome atmosphere – a combination of great basketball, laid-back camraderie complete with live DJ and great music. Each year Hoops for Hope has kept costs to less than 10% thanks to the generous support of our sponsors. This allows more money to go to research and care for those who live with CF everyday. To learn more about becoming a sponsor for Hoops for Hope, click here.